The natural course of vitiligo is highly unpredictable, but some evolution patterns can be delineated. Disease activity scores are needed especially to precisely define stability. The Koebner's phenomenon, tri(multi-)chrome vitiligo, mucosal involvement, leukotrichia, a positive family history, presence of antithy-roid antibodies or association with other autoimmune diseases predict a relatively poor prognosis. 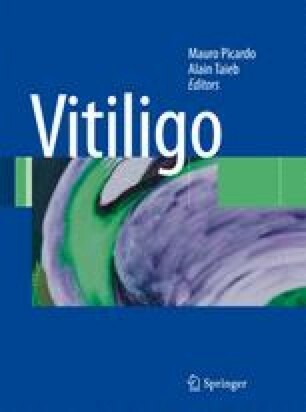 The prognosis of vitiligo might be predicted by the location of the initial lesions, a bad prognosis is expected if the initial sites are the posterior trunk and hands, less progression is expected when the initial sites are the face, upper or lower extremities. Leukotrichia means poor prognosis for repigmentation, with the assumption that no mel-anocytes are available within the depigmented area. The repigmentation induced by narrowband UBV therapy in NSV seems more stable than that induced by PUVA. However, ability to retain the pigment depends also on host factors and site of repigmentation (follicular, marginal, and interfollicular).